Top Ten Tuesday is a weekly linkup of book bloggers hosted by The Broke and The Bookish! 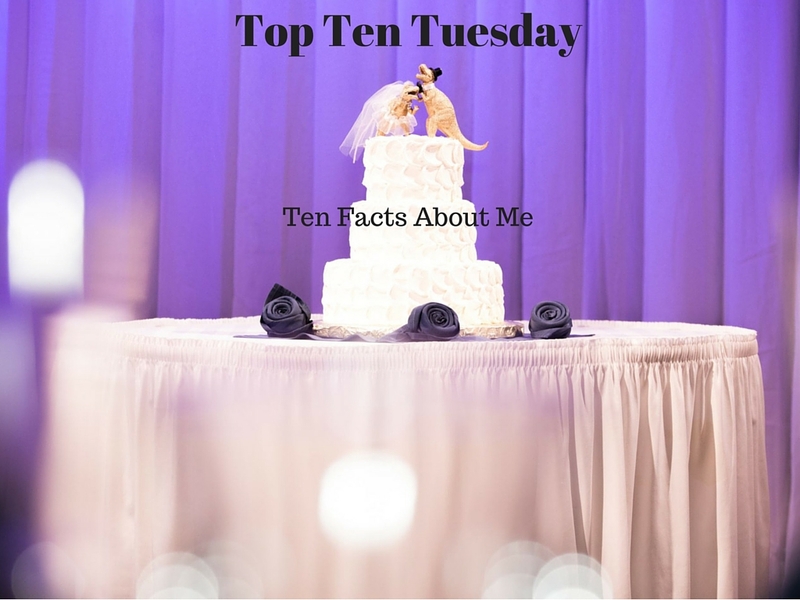 This week's post: ten things about me! Which is fun and I'm really looking forward to reading everyone else's. I suspect it's not just me who doesn't always click over to the "About" page on most blogs, so the lives of my fellow book bloggers outside of just reading are largely a mystery to me. There are several of you out there who do post some personal content, and I'm toying with the idea of doing the same eventually (some sort of monthly wrap-up?). We'll see. Anyways, here are ten things about me, Gabby, the reader behind 500 Books! I'm a newlywed: I just got married a little less than a month ago to the man I've been with for nearly four years and while wedding planning was one of the least pleasant experiences I've been through, we had a super fun wedding and I'm really glad to be married. I used to be a lawyer: I've mentioned in a few of my posts that I went to law school, and I practiced in Michigan for about a year and a half. Being a lawyer had been my lifelong dream, until I started actually being one and quickly realized it was not a good match for my anxiety-prone temperament. I've been out for four years now and moving on was 100% the right choice for me. I've lived in three different states: Not just three different states, but in three different regions of the country. I was born and raised and went to college in Michigan, then spent three years in Alabama for law school, and I've been out in Nevada since 2012. I will forever be a Michigander at heart and be homesick for my mitten-shaped home, but Nevada is where Drew and I plan to stay. I have terrible handwriting: It's legible, but most people think it's a man's handwriting. It's cramped and kind of messy and tends to list upwards if I'm writing on a completely blank sheet. I'm glad we mostly type on screens these days. I hate condiments: Yes, all of them. I don't even like dressing on my salad most of the time. I've got a lot of weird food things, this is just one of the weirdest. I'm a lifelong insomniac: It's gotten a little better as I've aged, but I have a really hard time falling asleep generally. I actually do quite a lot of my reading before bed because it's one of the most effective ways for me to wind down. But mostly I'm a natural night owl in a world where my job starts at 830 am. I spend weekends sleeping in to catch up. I love t-rexes: I am obsessed, y'all. Several adorn my office and my coffee mugs. And my favorite thing I did on my honeymoon? Visiting Sue at the Field Museum! That wedding cake with the t-rex toppers up there? Mine! I have clinodactyly: Which just means that my little fingers curve in towards my ring fingers. It doesn't necessarily mean anything on its own (though it is associated with several genetic conditions, including Down's and some forms of dwarfism), it's just a neat and weird little quirk. My grandmother on my dad's side had it as well, but not as strong as mine is. I pole dance: I've been doing this off and on for about 2 years, but only consistently for the past six months or so. It's fantastic exercise, and anyone can do it...albeit at different paces. There are girls who have started long after I did that can do stuff I can't even contemplate, but it's super fun and I'm learning at my own pace. I've been a vegetarian since I was 15: Over half my life now! I gave up red meat around 14 and all meat a year later. No, I don't eat seafood, and I hate that people who do call themselves vegetarians. Sea creatures are animals too. The first year is the hardest, so many family holidays revolve around meat. Once you realize it can be done, getting through them without partaking in the main course, it's much easier. I'm not a proselytizing vegetarian though, whether anyone else eats meat (like my rabid carnivore husband) bothers me not in the least. Also, I think it's amazing that you pole dance! I like to dance myself, but pole dancing seems very difficult. Thank you! I found those cake toppers at a particularly low moment in planning and it felt like it was meant to be because it cheered me up so much haha! I enjoyed my wedding and I'm so happy I'm married but I hated wedding planning with a burning passion. And I'm a super klutz but I LOVE pole. It's such a great workout! I also have terrible handwriting and I always have. I blame it on being left-handed, but I really don't know if that has anything to do with this. I'm really good at typing quickly and accurately though! I responded to your question about vegetarianism back over on my blog, but I agree that it is extremely frustrating when people think it includes seafood. Or chicken. Also, when I was vegetarian people would say things like "...but you can cheat, right?" They didn't get that it wasn't like trying not to eat too many sweets. Totally different kind of thing. Yay! 16 for me now...there's more and more of us all the time, which is why I'm stunned where there's some places I can go and have NO options besides a salad. I mean, really? Not even a veggie burger? Ugh.